trackscotland.co.uk :: View topic - Fuchs Titan Race - 15% off at Opies! Fri Sep 16, 2016 8:25 am Post subject: Fuchs Titan Race - 15% off at Opies! Any fans of the Fuchs Titan Race engine oils out there? We expect so, as they're hugely popular in the world of race, rally and pretty much all aspects of high performance motorsports, it'd be difficult not to have come across them by now. Premium, ester based fully synthetic motor oils designed to meet the needs of the most demanding applications - and as luck would have have it, Opie Oils are offering 15% OFF the range! This covers the Pro S 5w-30, 5w-40, 10w-50 and 10w-60, as well as the Pro R 10w-40 and 15w-50. 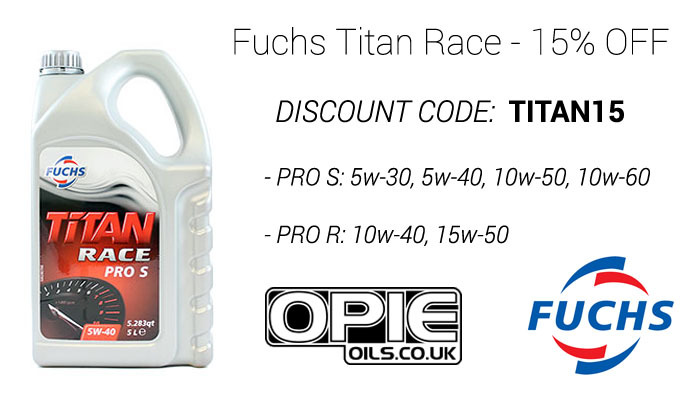 To get an idea of the savings to be made with this offer, lets take one of the most popular choices in this range as an example, the Fuchs Titan Race Pro S 5w-40. This premium product is usually �49.99 for 5 litres, however with this 15% discount, you can get your hands on it for just �42.49! We've also got some really handy and in depth technical documents that further explain the merits of fully synthetic ester oils, why not have a look HERE. Perfect for a bit of bedtime reading! That's all for now guys, and remember that code is TITAN15. Enjoy the weekend!